So many beliefs in our culture are beginning to shift; I believe that is at the heart of the current protests both in the Middle East and on Wall Street. Here in the U.S. it’s a matter of values—do we worship balance sheets or human needs? One huge meme that was the basis of our democracy was that individuals have the right to life, liberty and the pursuit of happiness, regardless of what a monarch decreed or wanted. People had a right to self determination. Of course on a more mundane level a meme would be that the iPad is cool but Microsoft’s old tablet PCs, which came out several years earlier, just weren’t. A lot of that meme’s acceptance was the result of the design of the iPad, and the WiFi infrastructure and number of Apps to support it. In a comparison to computers, a major meme like Democracy might be seen as installing a “new operating system” – one that was first downloaded during our American Revolution and later adopted in Europe and spread to various places around the globe. That “Age of Enlightenment” operating system also seems to have supported the Industrial Revolution and the growth of technology, which has seen the spread of science and knowledge for its own sake, and for the sake of profit, as an “obvious set of values.” Of course these values weren’t at all obvious to the Native Americans who had no concept of the ownership of land when they signed their rights away. But now that so many of us use computers it’s worth considering what it really means when the underlying programs can be changed, and things we took for granted can suddenly be revealed as arbitrary concepts everyone just accepted. Many of us who use computers, as Douglas Rushkoff has written in Program or be Programmed, remain obliviously unaware of the conditioning that technology can impose, especially when we don’t really understand how it works. But if we take a closer look at computer programs we use every day, and how they operate, we can perhaps also shift our own sense of who and what we are, and what life itself is. Bear in mind that our DNA, literally, operates as computer code. We can copy and paste it to create another species, as biologists are now doing—or to grow new organs. So in terms of memes, or beliefs, what if we viewed them in terms of computer “Templates”? 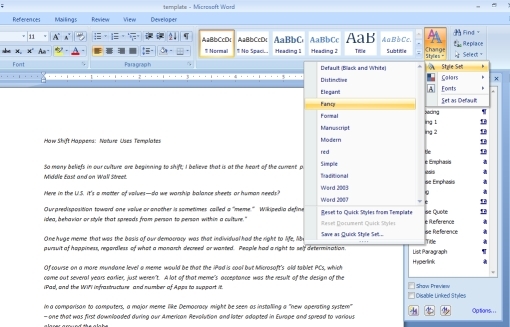 If you’ve ever used templates in a program like Word or PowerPoint, you know the powerful way applying or opening a different template—or set of coded instructions—can alter the features of a document or presentation. You can instantly change the font types, sizes, and colors, along with a myriad of other attributes to the text or overall appearance of a file. In genetic terms, perhaps we can see race as an obvious template for humans in terms of physical characteristics, and memes for mental or intellectual belief systems. Once a meme or cultural belief is widely adopted, it is transmitted genetically from one generation to the next. But how are memes changed? Essentially like a new template, a cultural belief is adopted first by a small group or a few people, and then more and more. Unfortunately for the people who suddenly come up with a new template for human beliefs, the cultures have not always been kind. Think of Jesus and Galileo as two prime examples of unconventional thinkers whose ideas caused them persecution. But if the template or meme resonates and strikes some deeper level, of understanding a shift happens, first in individuals and eventually in entire cultures, and suddenly beliefs change. The Gods become One God; the Sun becomes the center of the solar system, and more recently in our culture, we “know” that our location is merely that of one planet orbiting a minor star on the periphery of a galaxy among billions. But what happens when we suddenly begin to understand the very nature of our own belief systems and templates, and realize their arbitrary nature–and the extent to which they sometimes cause us suffering? A book that is part of a movement in just this direction is A New Earth, which opened many people up to the possibility that many of the memes and beliefs they’ve always taken for granted are misconceived—and a new template was suddenly applied to millions of peoples programming when Tolle’s work was promoted by Oprah Winfrey. 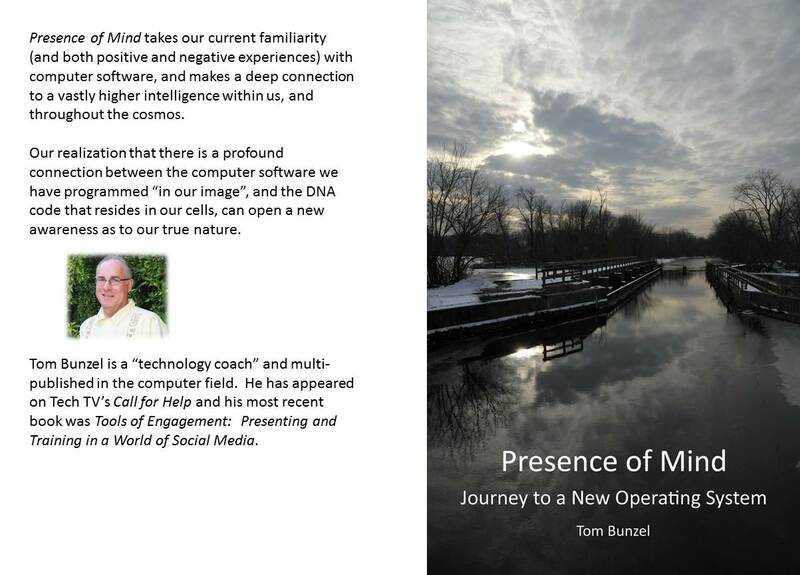 And then we might ask, what happens when we can connect the operation of life itself (DNA and Epigenetics) with the functioning of our own inner and outer worlds and belief systems? Does the realization suddenly hit us that we are not separate “things” composed of protoplasm but rather energetically connected to a Cosmos that is itself Intelligent on a level way beyond our own—that has manifested life according to a set of intentional instructions (DNA)? Can we drop the intellectual arrogance imposed by the scientific templates and expand our awareness? Then looking at the stars which seem to dwarf our existence, and a newly discovered subatomic quantum world that clashes with our common sense notions of cause and effect, can we then begin to completely reconsider what is truly significant and important? That is the shift that is taking place right now. Today a lot of people are suffering—studies suggest that one in nine Americans are depressed. And in fact many have lost their jobs and homes, and these are traumatic experiences that can shake anyone’s foundations. But I can speak from personal experience when I say that many of us are also the victims of a deeply conditioned set of beliefs that are now being challenged, and our suffering is not only the result of our actual circumstances, but rather conflicts within us about what the point of anything may be. Another study has shown that people in developed nations suffer from depression more than poor nations; some of this may be attributed to the fact that “advanced” nations have more of an infrastructure and interest in even analyzing such facts—and the time and resources to do it. But I believe that the crux of the matter (crux presumably being a word related to crucible) is related to the famous parable of Jesus that it is easier for a camel to get through the eye of a needle than for a rich man to achieve the Kingdom of Heaven. The reasons I am putting forth here are two: first those who are in advanced countries and not completely preoccupied with just surviving have developed an expectation of prosperity, which when threatened, leads to tremendous anxiety. In our country people who today have no job or home just a few years ago had both, plus all of the “things” that were supposed to bring them meaning—cars, boats, flat screen TVs, stereos, vacations, and so on. The second reason is that people in advanced countries and our own population in particular have been “educated”, or conditioned, into a reality that simply takes existence for granted—we seem to be here to consume and live without thinking much if at all about what the nature of Nature may be. In fact, our science tells us directly that questions about meaning, consciousness, existence, and our own participation in “what is” are unanswerable and meaningless. Our brains are used only for calculating how to survive and thrive—to build roads and bridges, go to the moon, cure disease—but not really to reflect or consider our relationship to what was here before we ever arrived. The immense power of the scientific prejudice that we don’t need to know or wonder “why,” just worry about “how,” has led to the dominance of a technology that now contributes to our feelings of powerlessness. We spend hours on the phone with faceless technocrats to fix mistakes in our credit, banking, billing and other critical matters, and even if we talk to a human, they are working from a script written by lawyers and accountants. Douglas Rushkoff has cautioned about this aspect of our reality in a book called Program or be Programmed, in which he urges people to understand the nature of brute technology for its own sake and how programming can literally operate to strip us of the ability to exercise control over our lives. And programming has its effect not just externally, in our ability enjoy life and be free of constraints of bureaucracy, but also internally in the way we have become conditioned to believe that we have the correct perspective and knowledge of how things “should be” – and when reality deviates, we suffer. I had a personal experience several years ago when two of my most fundamental beliefs about my financial stability and my emotional ability to live alone and apart were challenged to the core. My first reaction was a deep fear—like the foundation or floor of my existence was suddenly taken away and I was in a sort of free fall. I’ve been helped enormously by a deeper, more profound insight into the fact that much of what we think we “know” is in fact wrong. Writers like Eckhart Tolle have convinced many of us that our talking minds (the Ego) are not free, but in fact conditioned to believe we know how things should be. His concept is that when we fight with the present moment—how things are—we suffer. Again, this suffering is not because of the circumstances themselves—some of which can be dire to be sure—but rather because we have a false set of expectations, deeply programmed and conditioned, about how things ought to work out for us. 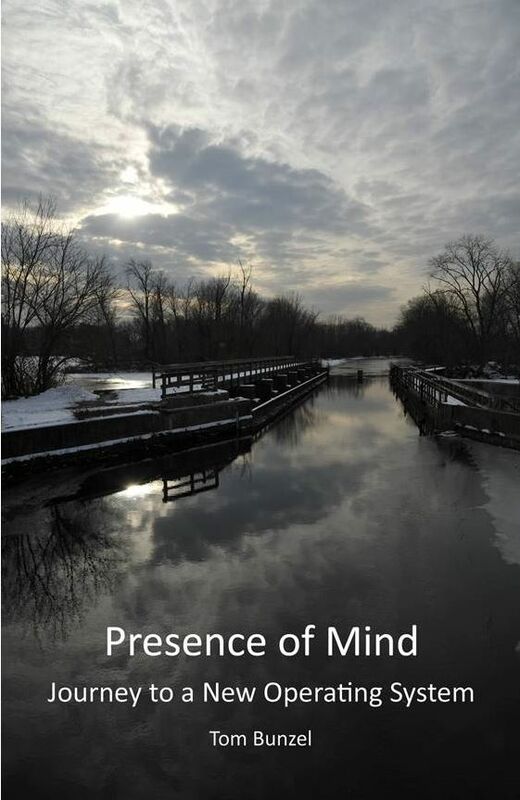 When my beliefs were suddenly exposed as wrong and my fear came up, it was my mind itself which was able to make a bit of a leap, using the ideas in the first entry in this blog, to recognize that I am not the center of the universe, but rather that I was subject to a set of programs that worked like computer software or an operating system. And, what’s more, all of life was programmed the same way, according to a set of instructions or commands that came into being before our “civilization” ever existed. Life has an intelligence beyond my own limited mental understanding or conditioning. Remember that it takes supercomputers to decode the genome – or our code or set of instructions—and that’s just the code. The energies or programs that run according to these instructions, through us and around us, are infinitely more vast and powerful than anything created by Apple or Microsoft. This enabled me to take a step back from the many assumptions I carried around about the nature of reality, and how things “should be” and recognize that they were mainly beliefs based on other peoples’ ideas—other people who may have meant well but who knew no more than I did. First of all, coming to this perspective is a daily practice and a choice—it takes effort to notice and understand, for example, that the noise being made by the leaf blower isn’t there to annoy me—I just happen to be there. In fact, nothing is about “me” in truth, because most of what I think “I am” is a set of beliefs that I’ve adopted from my culture—and the most massive belief is that what I experience every day is significant beyond my own emotional realm, and that nothing higher, more intelligent or greater really exists or matters. And I can’t just decide to discard these beliefs. They are in fact “my programs” and a living part of my own reality, which I also need to understand, accept, and perhaps even embrace. Life suddenly got a lot harder for many of us for whom it had been relatively easy (even if we didn’t realize it at the time). But we need to remain aware that we have the capacity to see it in perspective as it really is, and not the way we may have been conditioned to expect it to be. If We Can Copy and Paste Life—What Does It Mean? I’ve taught quite a few people how to embed a video into a web page or blog as a means of creating compelling content for their social interactions online; in fact I’ve featured the process in webinars which drew upwards of 1000 attendees. The process essentially is to copy and paste a block of “code” – a segment of computer instructions written in English – from a video hosting site like YouTube into the HTML panel for the destination page. HTML is the coding language of the Internet and instructs the web browser what to display on screen when a web page loads. Once the code for the page includes the proper syntax for the “embed” tag that points to the video, that video will display when the page loads. 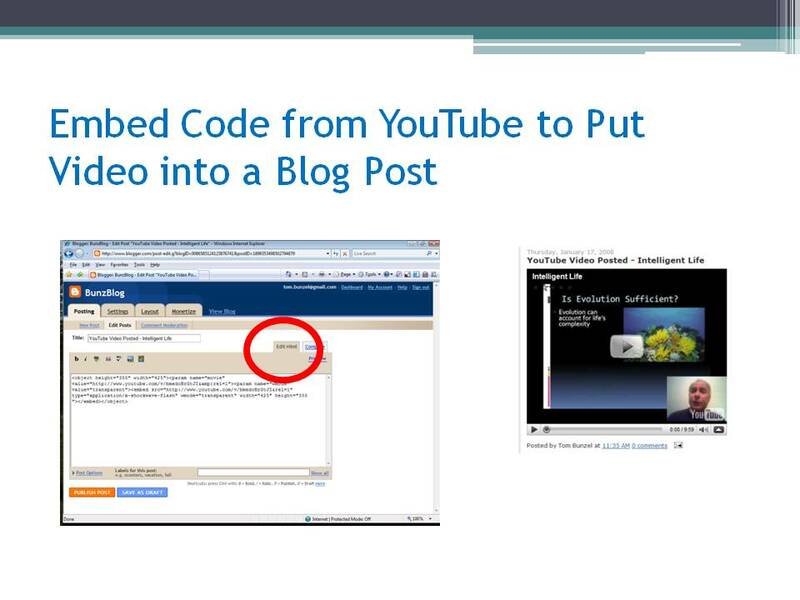 Here you can see a block of embed code from You Tube pasted into a post for Blogger, Google’s blogging program—in the HTML tab—so that it will display in the blog page as shown on the right. Essentially the DNA of the endangered species is “copied and pasted” into the egg of a host animal that is similar in type. The only difference from the YouTube embed code is that DNA is made up only of combinations and syntaxes represented by the letters ACTG, not the entire English language. As I’ve noted in the past, geneticists like Juan Enriquez, whose video I mentioned from TED, make no distinction between the way computer code operates and instructs, for example, a web browser, and how genetic code works with Life. On the day we visited, they were laparoscopically removing eggs from an ordinary housecat, then sending the eggs down the hall to have the housecat DNA literally sucked out of them. Once the housecat DNA is deposited outside of the egg, they will replace it with the DNA of an endangered Arabian sandcat, a completely different species, gathered from a tiny piece of skin. “And there you see it being inserted into the domestic cat egg,” Dresser explained. “And you made that from just skin?” Stahl asked. 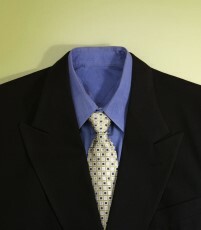 “Just from skin cells, right,” Dresser said. An electrical impulse starts the egg dividing, and if all goes as planned, the now sandcat embryo will be put back into the domestic cat to grow to term. Now, for most of us, copy and paste is a process we have used and understand. So for those of us who use computers and the Internet every day, how do we react when see that the language of programming literally runs within Life? For me, when I first encountered this fact, as a tech writer, it opened me up profoundly to a completely different view of life. After all, programs on the Internet, Blogger, Google, YouTube, and on your desktop; for example Microsoft Word which I am using to write this, were created not my one person, but by enormous teams of programmers who planned, wrote, and implemented their code to achieve a specific set of purposes. In reality, this code take electrical impulses, like the ones used to jump start the division of the egg of the Arabian sandcat inside its new host—but in the case of computer code it uses the electricity and silicon chips in the machine to manifest the ideas of the programmers—based on the interaction of the software with the end user. In the case of Life, the interaction is much more complex because it involves the brain, and the entire cosmos or environment with which the “software” interacts. In his book The Biology of Belief rogue biologist Bruce Lipton identifies the cell membrane as the “computer chip” that literally processes the information from the environment—a process that forms the basis for the new science of epigenetics. If I replace the embed code in the web page with a different set of symbols—I get a different video. If I replace the DNA code of a house cat with that of an Arabian sandcat, that’s what I get. Unlike some, I don’t see this as an argument for Intelligent Design or fundamentalism of any sort. To me, the answer to this question, at this point is, I Don’t Know. As I said, for me it is a powerful opening to the realization that life is far more than the merely random events that seem to happen through cause and effect, but rather that just as there is in your PC or laptop, there is an intelligent energy or software that is beneath or within the fabric of Life – or indeed is Life itself. Certainly the recent advances in quantum physics and neuroscience also suggest, indeed they proclaim, that mental and subatomic phenomena are not simple cause and effect processes, but rather that the presence of an Observer or participant is fundamental to their nature. So far, we have attributed the property of higher intelligence only to ourselves, and perhaps dolphins and whales, connecting it somehow only to our brains, which seem to host such mental activity exclusively. And, we speculate about finding it on other planets or in other galaxies. But if we understand that the same principles that we have come to know through our own experience with computers, the actual working of software—the ability to cut and paste symbolic representations to effect both electronic and natural expressions and manifestations—then it becomes clear that somehow a higher intelligence is at work in our cells. For one thing, decoding the DNA within us has taken supercomputers to do the sequencing. It is the expression of an immensely vast conglomeration of potentialities and variables—even for a one celled creature (some of whom have more genetic material within them than humans). Moreover of the DNA already sequenced, a large portion is called “junk DNA”—but that’s because we don’t know what it does or expresses. Some modern thinkers, like Eckhart Tolle, have said literally that a far higher intelligence than our own runs our digestive system, nervous system, respiration, and so on. Conventional scientists will argue that DNA “evolved” as life formed billions of years ago from organic molecules. It is clear that the mutation and changes in DNA, over millions of years, have produced many different species, most of them extinct. But if DNA is software ask yourself this: could software “evolve” out of an “uninspired” organic molecule—or is the notion of manifesting an idea through a set of coded instructions a function of consciousness of some kind? In other words, a mind – a term much of science finds extremely inconvenient—because a mind is not mere processing—but the capacity to conceive and manifest an intentional idea through mental activity. How do we know that mind exists in nature, even if science finds the concept problematic? Because we experience it each moment we’re alive. And now that we have created software (in our image), and have found it in nature and within ourselves we might say that consciousness is the intelligent energy behind the software of Life.